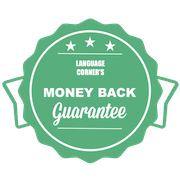 Language Corner sets high standards for their courses. That’s why we are confident that you will enjoy your course. So much so that, in case you are not satisfied, we will give you your money back! The student must submit a refund request before the third lesson of the student’s registered course. The student must attend both of the first 2 lessons of their registered course in full. The form must be submitted within 5 working days of the completion of the second lesson. The money back guarantee is only applicable to group courses and conversation courses. This offer does not apply to private lessons and company courses. The form can be requested from staff, via email or can be found here. Please fill out the form and hand it in to one of the Language Corner staff members.